5/31/12 Today’s Advice to My Beautiful Daughters – It’s not a race. More and more, we treat life like a race, like a sprint to some imagined finish line. We just want to get to the next thing, to be done, to get there. When we don’t get that instant gratification, when things take longer than we would like, we get discouraged, and want to give up. Life is not a race. It is a journey. Most of the good things happen between the milestones, between the start and the finish (whatever that may be). 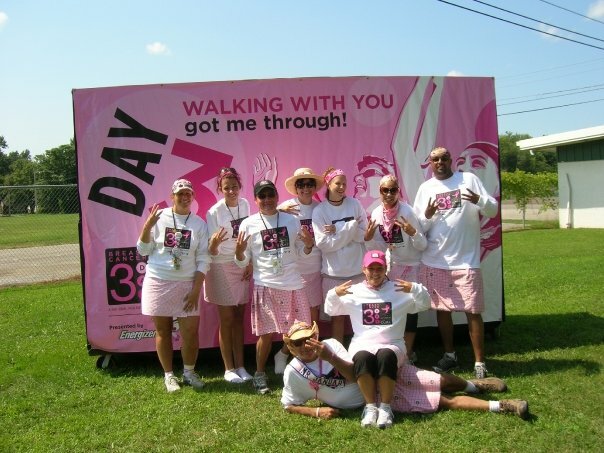 When I walk in the Susan G. Komen 3Day for the Cure, the start is exciting and invigorating, designed to pump us up for the journey ahead. The end is emotional, exhilarating, and is often an emotional highlight of my entire year. It feels so incredible to finish something so hard. But between the start and finish is the EXPERIENCE. 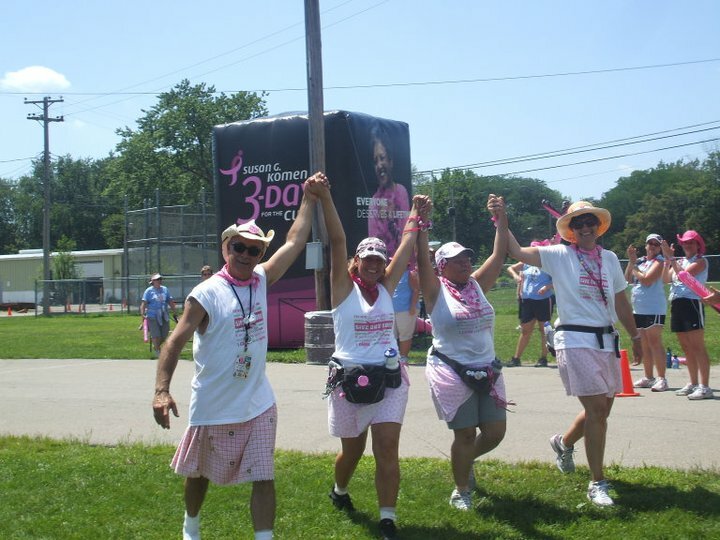 The pain of all those steps is a reminder of the battles that people fight every day. The end wouldn’t be nearly as sweet if the middle wasn’t so hard. If I treat it like a race, not only do I miss the good stuff, but I risk injury (trust me!) Long journeys teach me that putting one foot in front of the other, ESPECIALLY when you don’t want to, result in the sweetest finishes. Don’t get me wrong, beginnings and endings can be beautiful, heartbreaking and memorable. But they aren’t the only thing. When we focus on the finish, we lose sight of the now. If we focus on death, we don’t live. If we focus on being done, we miss the experience of doing. So don’t forget the journey. Don’t focus so much on the end, that you get discouraged or miss something. Put one foot in front of the other. Look around. Slow down. Eventually you will get there, richer for the experience. 5/25/12 Today’s Advice to My Beautiful Daughters (and me) — Talk less, listen more. I am having a love/hate relationship with my blog right now. So far, my blog has been about me sharing little nuggets, pieces of advice that I think are good life lessons for you girls. But at the same time, I feel like this little blog is an example of me doing all the talking, and your voice isn’t being heard. I feel a little like a phony, because I don’t’ always follow my own perfectly brilliant advice. I feel a little sanctimonious for being inspired with such incredible insight (it IS incredible, right?? ), and worst of all, insecure. When I post a blog, I watch the site stats obsessively to see how many people are “listening” to what I have to say and how many new followers I have. The talking has become the thing, and it is making me feel unsettled, because I don’t necessarily like the me that I see through that lens. These feelings also make me think that this blog is becoming more about me than you, and I don’t like that. I actually started contemplating putting something completely controversial out there (politics, gay marriage) to stir things up, but I’m afraid I will be criticized, so I hold back saying some of the things that are stirring in me. Despite my advice to you to conquer your fears, I am letting mine hold me back. Fear is what makes me write a blog instead of the book that I have always said I wanted to write. So even though this is me again…doing the talking, I have to tell you (again) that I don’t always get it right. In fact, I get it wrong most of the time, and this advice comes to you from the knowledge I gained from that mistake, and from knowing there is a better way. I’m scared to fall down. I’m worried that I don’t lead by example. And I’m terrified that you will look back on these years and tell people that you didn’t feel heard. 5/21/12 Today’s Advice to My Beautiful Daughters – Screw up gracefully. Before you get all excited and think that I have just given you permission to screw up…hold your horses young lady. All my other advice about doing good, leading by example still holds true. As you grow up and move away from the safety of home, remember that it is always important for you to have an escape route. Know your plan B and when you will execute it. What I am really talking about is learning to recognize that you have made a mistake and learning to recover without digging a deeper hole. You see, we are human and we have a really hard time admitting when we are wrong. Sometimes we become so committed to our mistake that we can’t see our way out. We throw good money after bad, both literally and figuratively. So stop the madness. Know that it is ok to be wrong. It is ok to screw up. Admit it, plan your escape, apologize and move on. Give yourself grace. Recover grace-fully. Most important, never ever forget to apologize to those who your mistake has hurt. A genuine apology can right a whole lot of wrongs. Giving grace, accepting grace…recovering grace-fully. Remember that mistakes are just mistakes. Don’t get them more power than that. For more on mistakes, refer back to this blog post. Today’s post was inspired by a comment on yesterday’s advice by a blogger I just met.